Agnes Gonxha Bojaxhiu was born in Skopje, Macedonia, on August 27, 1910. As a young girl, Agnes developed the desire to serve God as a missionary. The desire was strengthened at age twelve when a Jesuit missionary visited her classroom and spoke of his ministry to the people of India. This inspiration led to her joining the Sisters of Loreto when she reached the age of eighteen. The sisters, an Irish community that had schools in India, sent Agnes to one of these communities soon after she joined. When the young lady took her initial vows, she chose the name of Teresa after Thérèse of Lisieux, a saint that she greatly admired. Upon taking her final vows in 1937, she became Mother Teresa. After teaching in a high school for girls for several years, Teresa developed a feeling that she was called by God to do something more. In what she later called her “Day of the Inspiration,” September 10, 1946, Mother Teresa, while riding a train, asked God for guidance on just what her ministry should be. During the train ride, she had visions of the very poor and dying that she had seen on the streets of Calcutta. She knew that working with these people was what God was calling her to do. After much discernment with her Archbishop and within her order, Mother Teresa was allowed to leave the Sisters of Loreto, but she maintained her vows of poverty, chastity, and obedience. With little knowledge of health care, Mother Teresa spent some time with an order of nuns whose ministry was caring for the sick. When she returned to the streets of Calcutta, she began to pick up abandoned children off the streets and taught them, first, basic hygiene, and then the things the unschooled children had never learned. She also carried the sick and the dying back to the small hovel that had become her home where she treated them or, in the many cases where they were about to die, showed them the love that they had never known. 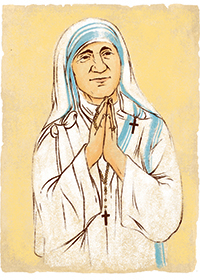 During Mother Teresa’s lifetime, the Missionaries of Charity grew in number to many thousands and were joined by the Missionary Brothers of Charity, an order for men established by her when several men wished to be part of her ministry. The orders spread to every continent and to large cities such as New York, London, and Los Angeles. In each of the places where the Missionaries of Charity are located, the order lives by the same rule of poverty established at the beginning. Many people called Mother Teresa a “living saint” during her lifetime. Her holiness was recognized by popes, bishops, and the laity. Acknowledging this holiness, Pope John Paul II waived the five year waiting period and began the canonization process some two years after her death on September 5, 1997. She was beatified by the pope on October 19, 2003. How have you shown your love for the poor? Do you, as Mother Teresa did, see Jesus in every face?